The weather fronts bringing plenty of rain to The Natural State in recent weeks have altered the fishing landscape somewhat. Some lakes such as Greers Ferry are well above the normal conservation pool target for this time of year, while Lake Nimrod is a full 12 feet above full pool as of Wednesday. Gate changes and lots of water that backed up the Red River have led to urges of caution navigating Little River at Millwood Lake and the tailwater below the dam. 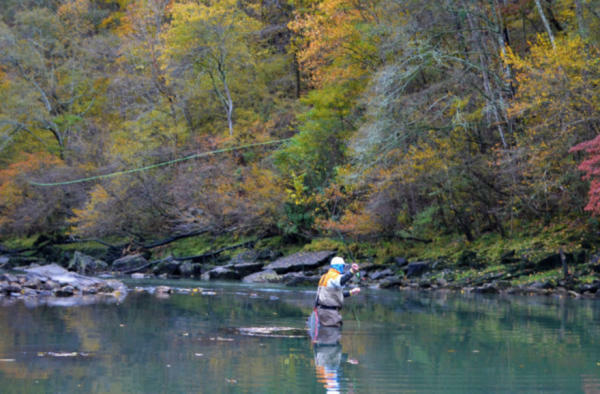 Last week, conditions in the Little Red River (photo right) were perfect for fly-fishing. But guide Greg Seaton tells us that after almost 6 inches of rain over the previous five days, the Greers Ferry Lake level was 464.87 feet msl. This means that it is in the flood pool and generation will increase to lower the lake level to 462.04 feet msl, the normal pool. Generation will be on a 12-hour-with-two-unit basis. This can vary on the stop and start times due to power demand. It can be a split pattern with early morning and afternoon periods of generation. This will continue for the rest of the week. The water levels in the lower river and White River at Georgetown will dictate the flow after that, with a possible increase when the lower river will accommodate it. Check each day for the proposed generation schedule. The point is, be careful out there and check water levels wherever you intend to go for fishing. There are nice opportunities out there, but plan accordingly. Fog has been noticeable lately, and dress in layers when it's cold.